Flora Cash is a Scandi-American duo made up of Shpresa Lleshaj and Cole Randall. The couple has taken it upon them to sonically explore the diversity of human relationships through minor keys and brooding vocals, they double down on their palette of inky blues and blacks, standing wholly apart from their R&B-Pop peers. Having “met” via SoundCloud and instantly e-hitting it off musically, their “atmospheric in theme and vibe” material had soon after been supported by the likes of Noisey US, Paste, Wonderland, The Music Ninja, Earmilk, The Line of Best Fit, Clash, Impose Magazine and more. Following the success of their last album, ‘Nothing Lasts Forever But Its Fine’ – most with lead single ‘You’re Somebody Else’, which has had over 6 million plays on Spotify and has also featured in numerous playlists such as New Music Friday USA. The track also went viral on YouTube with 4.8 million views, which was the breakthrough moment for the couple. Flora Cash also have a substantial year of live performances ahead of them; they’re set to be playing across the world, from Hanoi to Miami, and also making their debut at SXSW this year. 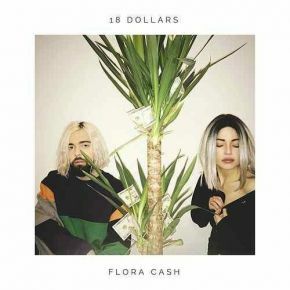 Flora Cash now release their new single ’18 Dollars’ where Randall leads the sincerely sublime R&B ballad with husky, reverberating vocals. Minor-keyed guitar wraps Shpresa’s stony harmonies, as they rest on a spine of solemn brass and bass synths. Lleshaj takes centre-stage during the bridge, and the contrast in vocals is poignant. The duo comes together again in the tragically touching closing chorus. The pair skilfully blend elements of acoustic music with ethereal production, hinting at Mt Wolf, Poliça, Vogue Dots and Kings Of Convenience. The honesty of their lyricism is constantly tinged with dark moments, moments of doubt, of anger, of pain fully present in the sonic backbone of Flora Cash. The single is available now via the Swedish label Icons Creating Evil Art.